What tools do PPM teams use to manage their projects? Learn best solutions and best practices for managing your project portfolios. Project leaders use a variety of tools to keep their project portfolios on track. When choosing PPM software, it’s important to get powerful tools that work across the organization, for better project visibility. See what ProjectManager.com can do for you and your organization. When you’re managing projects across a portfolio, there are many moving parts you need to track. There’s the strategic alignment, change management, budget allocation, and resource management across the enterprise. Plus, project portfolio management can inherently mean more risks and constraints, all of which require robust PPM tracking tools that can be extended to multiple teams. Without the proper tools and techniques, these problems can become quickly overwhelming. Project portfolio management is a project and program management technique employed by project managers and PMOs in order to plan, manage and execute numerous projects without abandoning strategic alignment or constraints. By combining projects into a portfolio, PPM managers can analyze statistics for several projects at once to better allocate resources, tasks and funding. Without this top-level view, it can be easy to lose the control required to balance several projects while meeting budgets and deadlines. Before you take on a project portfolio, it’s critical to equip yourself with the best project portfolio management tools available to handle the layers involved when executing several projects simultaneously. Project changes are unexpected and can happen quickly. 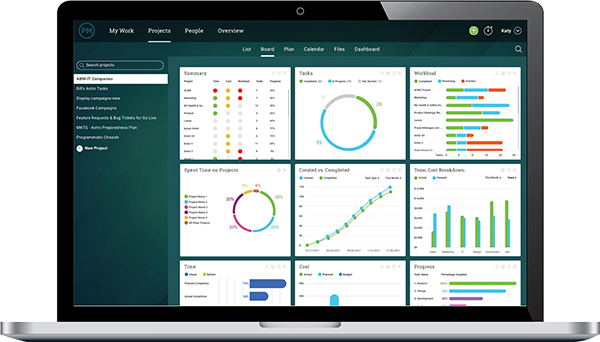 Get real-time business intelligence anytime, anywhere with our always-on Project & Portfolio Dashboards, and react to changes quicker than ever. 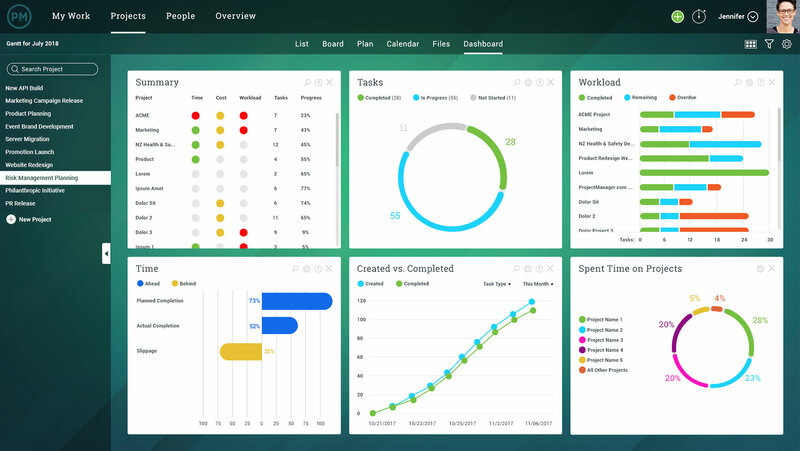 Get deep data views on project performance and team workload, project budgets and task status across all your projects and teams.Visual graphs make it simple to decipher critical data when you need to make a decision that can make or break a project. Create groups of projects to represent individual project portfolios, or even portfolios within each other. 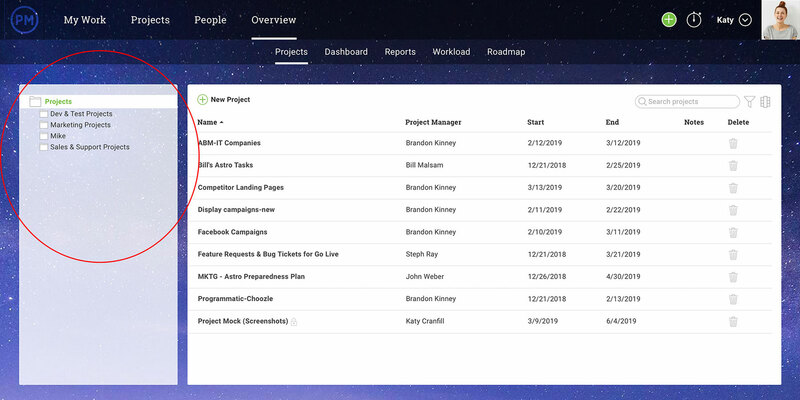 When you create project groups in ProjectManager.com, you can get group or portfolio-level dashboards, reports and even Gantt charts on select groupings of projects. Organize by team, region, schedule or portfolio manager. Get group dashboards of each portfolio so you can analyze trends across a variety of key data points. Our powerful, enterprise-ready Gantt charts are 100% online. Prioritize and link tasks across all of your projects to track progress across the portfolio. Capable of supporting thousands of tasks, we also feature full MS Project & Excel data integration. Plus, you can create group Gantt charts for the PMO or teams, or get the ultimate Roadmap Gantt of all your projects, to finally gain visibility across your entire portfolio in one global Gantt chart view. Our PPM Gantt charts are also interactive and collaborative. Just drag and drop to schedule due dates, update progress and link tasks. Attach files, media & discussions for enterprise-level collaboration to keep your global teams connected and your project data in one place. Balancing a finite number of resources across active projects in a portfolio can be one of the more difficult challenges of a PPM manager. Fortunately, you can manage workload across the enterprise with our easy-to-use resource allocation and timesheet tools. You can see at-a-glance who’s overloaded, and change allocation on this page. Plus, get custom workload report, define global holidays & working hours, and get better visibility into your team across all your projects. Real-time data is one thing, but sometimes you need to access historical data as quickly as possible to make strategic planning decisions. Develop custom reports or choose our automated reports on Portfolio & Project Status, Timesheets & Workload, Risks, Issues & Expenses, Project Variance, and more. Once created, these customized reports are easy to share to team members and stakeholders, giving you confidence for your next progress report or performance evaluation. Team oriented tools like task assignments and online timesheets let you assign and track work across every project in your portfolio. As your team members securely update their tasks, their timesheets are automatically updated and ready to be submitted for approval. When you combine our online project & portfolio planning features with powerful sharing & collaboration features like task-level documents, team discussions, media attachments and virtual stand-ups, you get the most powerful software available for project portfolio management. As a PMP or PMO with a project portfolio, you have a lot of work to manage and shepherd to a profitable conclusion. Don’t hamper yourself with clumsy legacy tools or underwhelming, lightweight applications. You need powerful, award-winning PPM software to reach your full potential as a manager. So take your free 30-day trial of our project portfolio management software, and hit more planned targets than you ever thought possible.